I'd like some help with a few things. I'm not selling to make a living just to pay for my hobby as a start and I'll see where that takes me. I should be able to move plants, I already talked to one Feed-N Seed store that will buy from me, I go to monthly farmers Markets and could use Craigslist and Facebook to sell along with getting more stores to sell to. I've been crunching numbers and it seems the flat, insert and soil will be between $2.32-$2.48 a flat and the seed cost will always change depending on variety. How is everyone pricing plants and figuring out what you need to make per flat/6 pak to make it worth your time? How sells the cheapest plant labels? How big do you want you're plants when it's time to plant in your area? Is it better to sell 4 paks instead of 6? Do bigger plants in bigger pots sell better? Do you have a cost calculator for MS Office to figure out costs? What about a soil calculator to figure out how much soil you need per flat? That's enough for now but I'm sure I'll have more later. I grow plants for a couple of nurseries in my area and charge them 50 cents per plant; they take 50 to 75 plants per year. That's not really very many but they are not able to get plants that I grow so it is a specialty order. The nurseries both charge $1 per plant and sell out. As the popularity increases the orders have also increased. I repot into 2"X2"X3" single plastic pots and use plain white plastic labels purchased on e-bay and write the variety name on the label with a sharpie marker. Also I provide a couple of printed description sheets that have been laminated. The nurseries like the plants to be in the 8" to 10" range ready by mid to late April for the early birds in the area (they usually freeze the first ones and then repurchase to plant at the regular May date). I don't know about bigger pots and plants. I have not really done a cost accounting to see whether it makes much money but since the extra plants are growing along with my own 300, a little extra work and time is insignificant and I like the cash to supplement my costs. If it gets to be bigger I will do the math. Last edited by joseph; November 20, 2017 at 03:21 PM. I sell tomato plants at the farmer's market... People are primarily looking for one or two plants. Therefore, I stopped growing in 4 packs or 6 packs, except for my own use. You might get different results in your area, or if selling at the Feed-n-Seed. Therefore, I sell plants that are about 6 weeks old in 24/flat pots, or that are about 8 weeks old in 3.5 inch pots (18 per flat), or that are about 10 weeks old in 3 quart pots. I upgrade the pots as plants over-grow their previous pots. At my farmer's market, none of the farmer's sell tomato plants in packs. I base prices on greenhouse space/time... The longer a plant is in my greenhouse, preventing me from growing other things, the higher the price needs to be. With that said, there is a standard price for plants in the local area. If I ask more than that, they don't sell. I can get that price at the farmer's market, but only about half that if I sell to local stores. It's easy to fill a flat with soil, and then dump it out to measure how much soil goes in flats with different sized pots. But the cost of soil is a tiny fraction of the cost/labor of growing a plant, so I ignore soil costs. I opt for premium quality potting soils, cause it sure beats fussing with irrigating with nutrient solutions. I try to have a variety of different sized pots available each week. Some people want instant gratification, others would rather get 3X as many plants for the same price. Last edited by joseph; November 20, 2017 at 03:25 PM. Amsterdam is a good source for seeds. What I did may or may not work for you, each area is different. When I sold some of the starts I did ( I gave about 500 away to the community garden people), at $3.00 each or 4/$10.00, they were in the solo cups with holes drilled through the bottoms. I wrote on the cups with markers, variety, color, size of tomato and leaf type. That way, no labels to lose, being me, or smudge, or to be pulled out and put in the wrong cup. Plants were 6 to 10 inches in the solo cups date of sale. I bought the solo cups at walmart, and with soiless starter, seed, water, fertilizer and my work, I figured I had right at 50 cents a solo cup/tomato plant on average invested. I also paid one of the neighbor hood girls to help set up the tables in my driveway and sort plants out. That was not figured in the average cost. I did not sell any 4 or 6 packs. Advertised on Craig's list and on the local radio swap show that goes on early Saturdays - all free. I did do the Craig's list for 3 weekends prior to and including the weekend of the sale. I ran the sale Saturday and Sunday, 10 am to 3 pm under the oak tree, also offered bottled water for 50 cents ( was in a big tub with ice). I also gave up selling six-packs. Most people have gardens too small to want that many plants of one variety. I buy 4" square pots in a "sheet-o-pots" insert that fits into a 1020 web flat, 18 per flat. I fertilize with osmocote. My prices are low, but my market has very low prices on almost everything. I price my plants at $2 each or three for $5. I sell dwarf and microdwarf plants the earliest, then tomato plants for peoples' outdoor gardens in May, and then peppers after that. Dwarfs will sell long before the ground dries out enough to plant a garden. Plant sales are very weather-dependent. People will buy anything on the first warm sunny day of spring, but no one knows exactly when that will occur. Herbs are decent sellers, especially if you can buy your seed in bulk. I have a dwarf basil called Emily that I like. Cilantro and parsley are decent sellers. I am going to try to expand to chives, mint, and wheat grass to see if they sell. I am thinking that microdwarfs in pots would probably sell all summer, especially if they had tomatoes on them already. But in my area, people plant their garden in the spring, and then the market to sell tomato and pepper plants is over. They don't sell after about the first weekend in June in my area. I go into flower-selling mode at that point - dwarf sunflowers, dwarf zinnias, and marigolds. As a consumer before I knew what I was doing gardening - I liked the 6-pack bargains. After learning how to grow from seed, I did sell to a few people. They liked buying one of each type that I was offering. My prices did not make money, but I was selling to friends that wanted to grow for their first time or to grow something different. They wouldn't take them for free, so I sold them 12 plants for $5. Offering a free blue cherry tomato plant with purchase is fun for you and them. Over the years I have always wanted to at least break even on costs ,and as said above supplement my hobby/Forest Bathing(eastern medicine therapy practice)plain old get away from .....Tried the horses,plywood,flats,seems like I created more energy draining forces(work)so that model went out the window.I usually run two germanations and two or three harvests of whatever we decide for that season(mine is from sept.thru may)so I/we in sunny Fl.get some kind of sun 365/d every year.during that time I pull a permit for a multiple family massive clean out garage sale(11 bucks)sat sun after new years at usually my second harvest showing on plants everywhere in yard outside etc.A craiglisting,local blog,those cheap garage sale signs and they come.Thanx to f book,social media and the I phone they come in Mercedes,Bmws,and then some.they browse,pooh pooh this and that ,and notice those specialtys,a towering piper nigrum telephone pole looking mass of berrys,green black red and pink.Along the base growing mini plants in old plastic containers and they want one!oh look a okra plant striped,purple,pods galore three foot high,tobacco at 8 ft.ripening cherry plants,oh look mint ground cover in the two foot high Aloe plants.yes they come red bottomed high heels,diamond I phones Cash..the poor farmers hidden revenge.We make a killing,the flats are a loss leader,not really.Not for all parts of the country,but they come with cash,you gotta love "market forces".PS. And if you have that cute little white cc swipes attached to your I pad you will not lose that sale since no one carrys "stacks" in rubber bands no mo.A I ft cherry mater plant will get me 5/ 10 bucks when a full grown plant behind it with ripe cherrys dropping off and a sign saying for display only,our permit states no food sales,ornamentals is is then. Last edited by kurt; November 21, 2017 at 03:16 AM. From all the info I'm gonna do some 4 paks for the F-n-S stores and singles for all other sales. I priced everything from Grower Solutions and came up with a price per flat including tray, insert and soil at $2.54. That's for 18 plants per flat. The 4 and 6 pak inserts are the same price per 100, $63. Does anyone have lower prices? I converted cubic inches to cuft and it's .3 cuft per flat and that was using the tray size, 11"W x 21"L x 2.25"deep so there should be a little leeway and that's close enough to perfect for me. I'm still not sure on pricing yet, I'll have to check a few places and see what the going rate is this year. Last season the prices on 6 paks were $1.75 from the local nurseries and I think Bonnie's were $3.50 a 6pak or the same for a single bigger plant. I just looked at a guys facebook page had here's his prices I can use as a start. Also soil mix in front of counter on right($8), manure on left($8), and pine straw on the front deck($9). above all KNOW YOUR VARIETIES. you literally need to be able to sell snow to an Eskimo except you are selling tomato plants to the consumer. ask what they are going to use the fruit for, know what varieties you have are good for. and then throw in the normal round red marglobe or rutgers, big beef and a paste... roma etc...match up their needs to the fruit. the largest I sell is in a 4 pack for canning tomatoes. most people don't want 4 or 6 of the same variety. but truly, most people don't quibble over a few plants. get to know container labels. Cole Robbie mentioned the pull apart sheets... that is an "1801" it fits in a 1020 tray. 1801 means there are 18 single cells. 1020 is the size of the webbed tray the sheet of cells fits in and you must have the webbed flats. don't but a "true 1020" that is a true 10"x20" tray. most of us buy a 10x20 that is 10.5"x 20.5 " and the inserts wont fit into that true 1020 unless you have bought true inserts also. you can't mix and match them. you can mix and match brands without it being much of an issue just not sizes. 1203= a sheet of 12 triple cell tear apart inserts. a 1204 is sheet of 12 tear aparts with 4 cells. there are multiple inserts configurations available. these are the just most common. 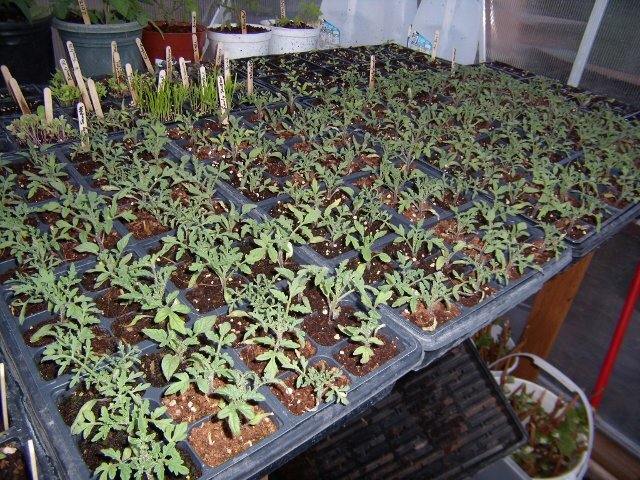 I put my most expensive seeds usually hybrids in single cells I put open pollinated in multiple cells. charge the same price for every cell pack. makes it easier to not mess up and lose money on more expensive seeds. the longer it takes to grow something them more expense you have in it whether it is time or fuel keeping them warm. I buy tags from John Henry co. they are about .04c eac usually. but I am buying hundreds of each variety you can also buy blanks from them and write on them with a contractors marker... not a regular indelible one. regular sharpies fade before you can sell the plant. I grow a lot of plants so I buy 25 bales of baccto. and sometimes I need more. if I have a customer who wants a large container filled I usually have to make a run for a few more bales.I pay about 22.00 a bale for baccto. I bought the loose fill two years ago but I didn't like it so I went back to compressed bales. I buy osmocote in a 50# bag and add it to every pot or tub of mix.. add that to your mix and you will have a much nicer finished product. BUT I also fertilize everytime I water my plants. I have an injector in each greenhouse. [QUOTE=Rajun Gardener;672430]Thanks for all the responses!! anything in bold... I have never sold much of. so if you start them go easy on the amount you plan on. I purchased Mojito mint from Richters a few years ago. I believe they still carry it.